Microsoft has launched yet another Lumia phone, but with a price point that makes it affordable to all. 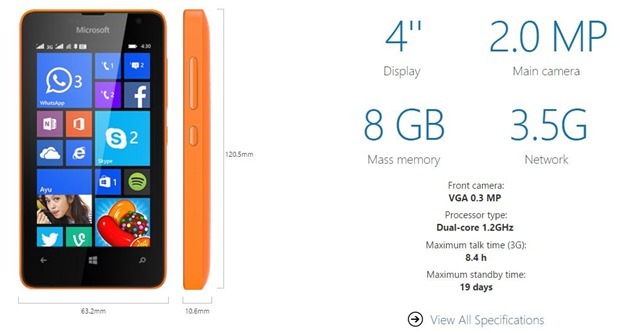 They officially announced launch of most affordable Lumia to-date, The Lumia 430 Dual SIM. Priced at just $70 (approx Rs. 4400 in India), this their cheapest phone from Microsoft Lumia stable. And while the price of this phone is low, it does have decent hardware specifications to boot! The phone comes with 4-inch LCD display with a WVGA (800X480) resolution having 235 ppi pixel density. Under the hood it is powered by dual-core 1.2 GHz Qualcomm Snapdragon processor and decent 1 GB of RAM. As far as the storage goes, it has 8GB on-board storage with can be expanded upto 128 GB through MicroSD card. Microsoft is also offer free cloud storage of 30GB for all Lumia 430 users. The Lumia 430 seems slightly weaker when it comes to camera – it has a low 2mp fixed focus rear camera and a VGA 0.3mp front facing camera. On the connectivity side it has 3G, 2G, Wifi, Bluetooth and all other standard specifications you would expect from a smartphone. It also has Ambient light sensor, Accelerometer and Proximity sensor. It has a replaceable 1500 mAh battery that promises a talk-time of 12.9 hrs and standby time of 19 days. On the software side, the phone is loaded with Windows Phone 8.1 and the Lumia Denim Update, that can be upgraded to Windows 10 when it becomes available later this year. Colour options for the Lumia 430 Dual SIM include bright orange and black, and the device will be available in APAC, IMEA, Russia, Kazakhstan, Ukraine and Belarus from April. While the pricing will vary by market, but is estimated to be around 70 USD before taxes and subsidies. Lumia range of phones have met good popularity in India, especially with affordable Lumia 520. With Lumia 430, they have now lowered the entry barrier for Windows phones and it should definitely appeal to first-time smartphone buyers! Free Windows 10 Upgrades To All, Even The Pirated Copies! will it available in Bangladesh? it is best budgetary phone from Microsoft but only thing is Andriod software is missing. It is a best cheap windows smartphone from microsoft in lumia series,it is affordable in budget,we are waiting for its release date to buy. This is one of the best smartphone by Microsoft as people are looking for the Windows smartphone but during Nokia the price was high and for low price you won’t get front camera but Microsoft is providing everything that user wants. This is really a good news for users who are looking for budgetary phone. Microsoft has started to enter in this segment of mobile phones. I think it will give a touch competition to its rivals like samsung, micromax etc.